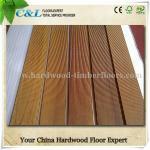 C&L hardwood in China is capable to supply four types most durable solid outdoor use timber decking material - Cumaru(South America Species),Ipe(South America Species),Balau(Southeast Asia Species) & Teak(Southeast Asia Speices) in various cutting dimensions. 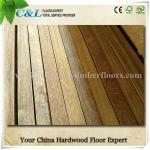 C&L hardwood also do other costom sizes hardwood decking according to clients requirments. 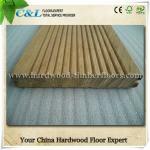 Hardwood outdoor timber decking joist: 40x40mm or 40x60mm matched hardwood material to decking material. 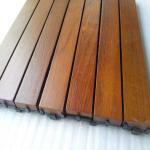 Timber decking usage : Swimming pool side,Porch,Balcony,Courtyard etc. Warranty: C&L hardwood timber decking has above 15 years in minimum usage time which depend on the maintenance & timber material type.While C&L hardwood top quality burma teak decking could be reached 50 years usage time under normal traffic.